Like many ladies, staying in shape and having that perfect hour-glass shaped body was crucial to me especially in this time and age when women are forced to look their best to be noticed. The same rule applies to men too, but it is more for ladies than men - trust me, I know. That said, working out was an important part of my life. It still is, but it is now harder to adhere to my workout schedules with my new responsibilities. You see, a lot has changed over the years and with my first child, my energy and time are hard pressed. So much so that getting any off time to work out proves to be a challenge. Unlike before, my little boy, whom I adore so much, takes up most, if not all of my time. If I am not playing with him or doing something for him, I probably am too tired to get anything done. Heck, chances are, I am blacked out on the couch or just any soft surface I could find to recharge ahead some hours of parenting. It is because of this that I decided to get a home exercise machine. I knew these machines existed; I just did not know which one would be perfect for me, let alone the types available in the market. After some intense research (it took me a whole two hours with some breaks in between of course), I decided to go with the WaterRower. The fact that I had seen something similar in the TV series House of Cards probably helped me make a choice in its preference. The ‘House of Cards’ WaterRower turned out to be the best piece of investment I have ever made. For a stay at home mom, the exercise equipment was heaven sent. It is designed to work the lower and upper body with a large efficiency while providing you with cardio exercise and strengthening with little time spent working out. Now, we shall get to review this unit in depth, but at this point, I just have to say that the sound the WaterRower produces during a workout, the swishing of the waters, is calming and gentle. The sounds resemble the white noise I use to soothe my baby to sleep. So the equipment helps me to kill two birds with one stone. Simply put, the WaterRower is a rowing machine specifically for home use. The specifications and product features are in such a way that you get to use the product with great ease getting all the benefits of going to a gym in the comfort of your home. Let’s quickly dive into the features and specifications. The WaterRower workout machine as you probably have already guessed from its name or pictures of its design is a water resistance rower. The equipment makes use of a water flywheel. It is simply a paddle that has been suspended in a tank of water and is used to provide resistance for the rower during a workout. This might all be sounding like rocket science to you right now, but once you see the machine in action, you will understand with perfect clarity. Most exercise machines make use of pulleys, magnetic units and hydraulic pistons to generate their resistance. So, what makes a water flywheel a superior technology that most rower manufacturing companies prefer to use to provide resistance? Well, simply put, water resistance varies depending on the level of intensity a user exerts to the machine while rowing. A high-intensity workout will generate a greater resistance. For an intense workout, all you will need to do is row vigorously and you will without a doubt feel the pain in your upper and lower body. In addition to this, the resistance can also be varied depending on the amount of water in the tank. When you reduce the water in the tank, the result is a lighter rowing experience while adding water results in increased resistance. This variable resistance offered is similar to that experienced with Air Rower units. This exercise machine, however, has an advantage since it has a more realistic outdoor rowing feeling courtesy of the splashing sounds in the tank. In addition to being more realistic, the unit is far much quieter and soothing than the air resistance rowing workout machines. The WaterRower features a Series 4 monitor that tracks most aspects of workouts. The monitor will keep track of the stroke rate, the heart rate, the duration of the exercise, the target fitness zone, distance and the intensity of the workout as well. All this data is displayed on the monitor simultaneously but in separate windows to avoid any confusion. Below is a breakdown of windows on the screen. This will display the number of strokes taken every minute from the start of the workout to the end. It will help to keep track of the calories burnt every hour as well as the power used. In addition to this, this window displays the rowing speed in m/s, miles/hour, minutes/500m and minutes/2km. A possible option for the workout equipment but is optional. Monitoring of the heart rate depends on the availability of the heart rate monitoring equipment as well. It is, however, not included in the purchase. This window will display the heart rate in beats per minute. This window shows the readings for the heart rate, stroke rate, and the intensity as well. It displays the time rowed down to the milliseconds. In addition to this, if at the start you had programmed a time for your workout, it will serve as a countdown window, showing the remaining time. You can see the distance covered in strokes, kilometers, miles or meters. Also, just like the time, if you had predetermined a distance before the start, this window will serve as a countdown displaying the distance remaining. On this window, you will be able to navigate through the advanced functions of the monitor. Aside from the display, the monitor comes with 9 buttons. 6 of these buttons are shortcuts, and 3 are navigation buttons. This separation on buttons makes the screen easy to operate despite the significant number of buttons on the keypad. The monitor runs on 4 AA batteries and is not backlit which makes it impossible to work with while in darkness. I particularly found this to be disappointing on the nights my son slept late, and I wanted to work out without disrupting his sleep. You can link the S4 monitor to a computer. You will, however, need to purchase this monitor cable separately. This feature allows you to upload the fitness data onto your computer for better analysis. If you like to workout keeping a strict and keen eye on your data like me, you will find this to be pretty useful. This WaterRower is constructed from solid Ash Wood. At first glance, it may seem of low quality, but when you have it in front of you to touch and feel, the rowing machine is strong and durable and perfect in absorbing vibrations. This helps in reducing the amount of sound produced. I weigh about 175 pounds. While working out, I tried to apply as much pressure as I possibly could to test the build, and the frame held perfectly. Sure, I may not be the strongest or the heaviest, but you can take my word for it, the build feels like it will last you for a very long time. For color consistency, the Ash Wood is stained and finished with Honey Oak. The water tank, on the other hand, is made from a polycarbonate which makes it almost indestructible. The seat sports an ergonomic design and features an extra padding to increase the comfort of the seat. Before I got my son, I used to visit the gym daily. And I can confidently say that the comfort on this rowing machine is the best I have experienced so far. Assuming you take proper form while rowing, you will be able to row for a very long time. As a matter of fact, while on the machine, the last thing on my mind is how the seat feels on my behind. The handle has also been designed with light and durable aluminum. It features an easy to grip construction design which reduces any risk of developing pains in the wrist. Most reviews state that the workout equipment comes with a 1,000-pound weight capacity. To me, this sounded too good to be true, so I contacted the WaterRower company to make the confirmation. They confirmed that indeed the weight capacity is 1,000 pounds. Easy to assemble. The assembly process takes no more than 30 minutes. Easy to store. The machine is stored by having it stand upright on its base. While it is slightly heavy, I found it easy to lift it with one hand. 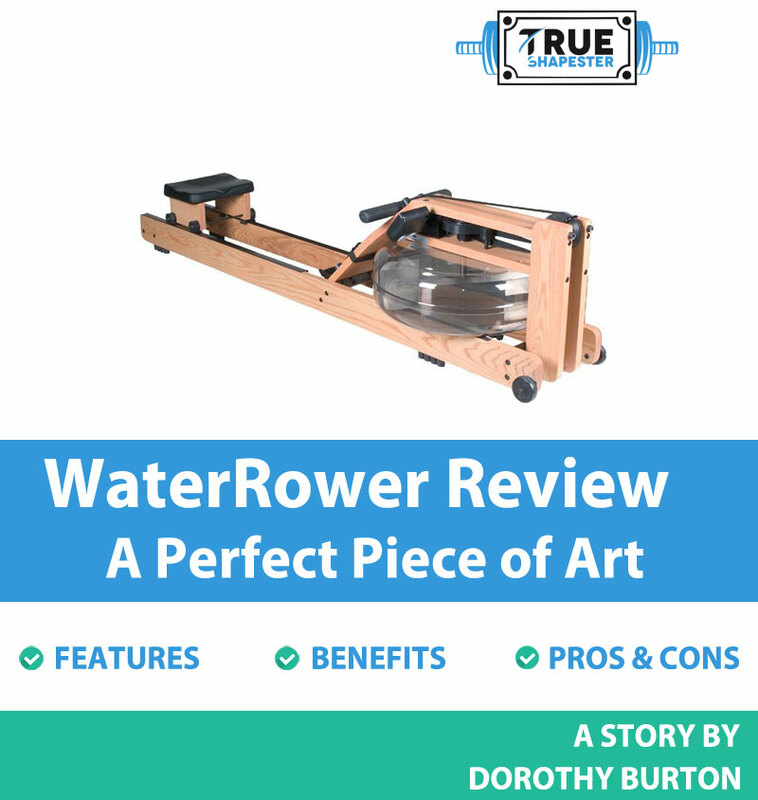 The WaterRower machine, needless to say, is a great product that combines style, design, good craft and function. While the low seat and the close footrests may be a problem for some individuals, it is not a reason to opt out from making a purchase. You will enjoy your home workouts on this realistic rowing machine. ​Now, I know I said the handle featured a comfortable design - which is true. However, when working out, you will sweat and also experience some intense friction with time. When working out for prolonged periods of time, you will most definitely feel the pressure and rub on your hands. These gloves are padded and cover the areas part of the hand that experiences most friction. This design helps to reduce extra sweating and also provides a firmer and more comfortable grip. They are one size fits all. The material is stretchy and allows for perfect fit in all persons. ​This mat is designed to protect the surface on which the WaterRower will be placed on during workouts. The mat is designed from closed-cell foam that helps in absorbing all vibrations that you may produce during workouts. Adding to this, the unit features 7 folding sections making it very easy to fold and also sports a non-slip and textured surface that is easy to clean when it gets dirty. It is true that the WaterRower is not the cheapest home workout machine there is on the market. However, the quality it sports and the results it yields make it worth every penny. The fact that it has a solid and durable build means that the unit will pay for itself with time. How you might wonder? Well, you get to save on gym memberships from the point you purchase this unit. In addition to being a perfect workout machine, the unit can also double up as a perfect piece of art – a piece of art that helps you get into shape. I highly recommend this product.